Hotels, golf courses, parks and other outdoor landscapes with large bodies of water often have problems with algae and water clarity. It can happen to large man-made water features or natural lakes that have no natural flow of water. Water Scenes are commercial outdoor water features and fountain specialists. We offer design, construction and consultancy across a large area of the UK. If you are interested in floating fountains or any kind of landscape water features call or email us. We will be happy to discuss any project or problem you may have. Water circulation in a pond helps to maintain an essential oxygen supply. This in turn promotes the growth of beneficial bacteria and aquatic life. Lakes and large ponds that have no external source of oxygen often have only the plant life present in the pond to rely on. This can be inadequate in many cases resulting in a surplus of plant food. This is one of the reasons why blanket weed starts to accelerate in growth. There are a couple of easy ways to add oxygen to water, but as I will explain most of these methods are not suitable for lakes or large ponds. The simplest way to oxygenate water would be to add a submersible pump to circulate the water. This will not work very successfully for a large pond because of depth and the amount of dirt and debris that sits on the bottom of a pond. It would soon block even the best dirty water pump. Another way to add oxygen would be to add air pumps which pump air into the pond via small pipes and air diffusers. Although these do not block, they do require a large amount of air pumping units to be located around the pond. This is not ideal, as most lakes or large ponds are in public or commercial spaces. There are many different sizes available to suit Large ponds and lakes. A basic floating fountain requires a floating unit with fitted pump and fountain nozzle attachment. The electrical connection can be as much as 20 to 50 meters away. 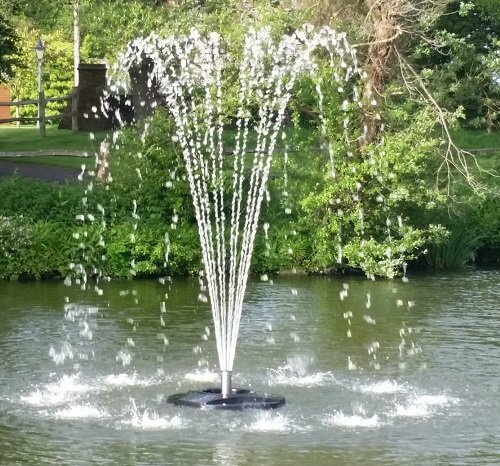 The fountains are available in single or three phase electricity supply. 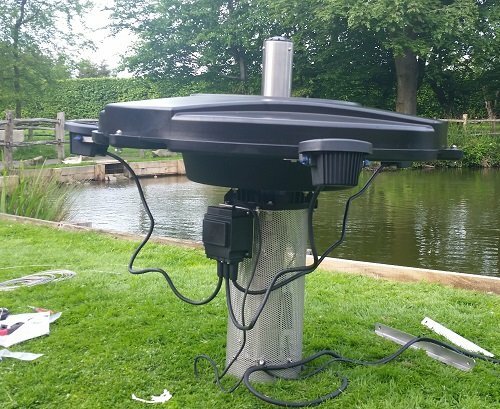 The most successful and spectacular method to oxygenate a lake or pond larger than 20 meters would be to add a floating fountain or water jet. A floating fountain explained in simple terms is a cluster of pumps, floats and a fountain head/nozzle all combined to make one single unit. They are designed to float on the surface of the water where the presence of dirt and debris is at its lowest. This allows the pumps to work without the risk of consistently blocking. This in turn allows large amounts of water to be pumped to a fountain head or nozzle which can jet or spray water up to 20 meters high. This will depend on the size of the pumps you have fitted. The fountain heads can also allow for the intake of air helping to oxygenate the water even more. Another bonus of adding a floating fountain to your lake or pond is the magnificent display of water that is created by the fountain. This can really improve a landscape. Floating fountains also offer the option to add an extra dimension with the addition of halogen or coloured led or RGB lights. This will illuminate the fountain allowing it to be seen and admired from afar. 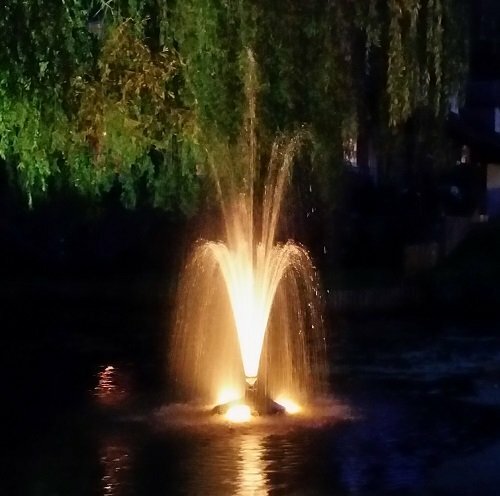 Floating fountains can be installed into any lake or large water body if you follow some golden rules. 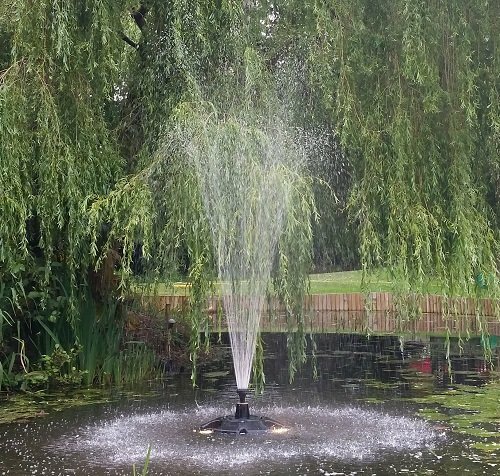 If your interested in having a floating fountain installed or supplied and you would like to discuss the options, please feel free to contact us. We offer basic fountains through to spectacular programmed dancing installations. Here at Water Scenes we hope that you will get many enjoyable years from your fountain starting with the right selection. We don’t believe if one part is broken you should need to replace the whole unit. Each fountain has a full list of spare parts and accessories available should you need to replace any part in the future. All floating fountains sold by Water Scenes have been selected to represent our high standards.